While we expected Nintendo to show up with a handful of new games at E3 2018 - including the coveted and still very much unknown Metroid Prime 4 - Nintendo spent the vast majority of its time talking about Super Smash Bros. Ultimate. But, right before Nintendo went into a 25-minute spiel announcing every character one-by-one, it announced something even more wonderful than we ever would’ve imagined: Super Mario Party for Nintendo Switch. The latest game in the series seems to lean heavily on some of the original N64 games: There’ll be four-player competitive mini-games, individual movement, movement-based items and the utter destruction of childhood friendships. It’s a bit cringe-worthy at parts, but the Super Mario Party trailer shown during E3 does give us an excellent look at what it’ll be like to play the game on October 5. Key points from the trailer is four-person multiplayer on a single console, four-person multiplayer on two consoles and the ability to play as Bowser and Goomba. Nintendo is wasting no time in releasing the next entry in the Mario Party franchise. While it could’ve very easily waited until next year, Nintendo says you can expect it to come out on October 5 2018. That will put it one month ahead of the new Pokémon Let’s Go titles and two months ahead of Super Smash Bros Ultimate that’s slated for release in early December. Let’s be honest, could a Mario Party game exist without four-player local co-op? It could, sure - just look at the 3DS version of the game - but it wouldn’t be very good. Thankfully, Nintendo isn’t going to subject you to passing around the Switch one person at a time and will instead allow you to use four Joy-Cons on the same screen in the traditional board game mode. Ideally you’ll be using this in your living room where everyone can see it, but if you do want some additional space because, say, you’re at a bar where it’s hard to crowd around a little tablet, you can use a second Nintendo Switch in tandem with the first for two-screen, four-player multiplayer ... but only in a mode called Toad’s Rec Room. Does that mean a two-console full-game experience is out of the question? No, but Nintendo has yet to confirm that. But what if you have a friend who lives far away? Will you be forced to keep that friendship safe and secure? No, says Nintendo! No friendships are safe with Super Mario Party. While details are thin at the moment, Super Mario Party will support some form of online play. Likely that will take the form of competitive mini-games and leaderboard rankings rather than full two-hour long sessions over long distances. While this might sound like Nintendo is copping out of a full experience - it makes sense. Nintendo Switch’s online infrastructure is still relatively new and should it go down during an hour-long session of Party, players aren’t going to be pleased. Early reports suggest you’ll be able to play with both friends and strangers, but there’s no word yet on chat support. So far, Nintendo says you can expect Super Mario Party to have 80 new mini-games in most of the categories you’re used to seeing in the franchise. There will be free-for-all, two-vs-two and three-vs-one mini-games (as seen in the controller) and potentially the return of the one-vs-cpu and four-vs-cpu games that we’ve seen in previous entries. One of the worst design decisions in recent memory was the switch from players moving around the board individually to a shared car that players take turns driving in Mario Party 9. Said politely, it was a mechanic that was not received very well. 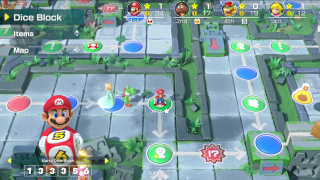 The good news is that Super Mario Party will return to the series’ roots with free movement, as well as items that alter movement speed that add a layer of tactical strategy to the game. In screenshots for the game we can confirm that Mario, Luigi, Daisy, Peach and the rest of the original crew are returning. If you're looking for some new characters, though, you can look forward to playing as Goomba, Bowser, Koopa Troopa, Diddy Kong, Donkey Kong and Waluigi, too. Here’s a place where we wish the Mario Party franchise could take a page from Super Smash Bros Ultimate as the latter is set to include every character from every title in the series PLUS new characters like Ridley and Inkling. As much as we love playing as Yoshi or Luigi, Mario Party has had more or less the same cast of characters for the last two decades. Similarly, some of the best (and most infuriating) levels in franchise history were the most uniquely designed. Rainbow Dream in Mario Party 5, Woody Woods from Mario Party 3 and Luigi’s Engine Room from the original game all had unique personalities and strategies to go alongside them. Boards have the potential to make or break a good Mario Party game, so it’d be wise of Nintendo to put their best designers at work to getting this next set as close to perfect as possible.